How many date codes and date stamps are on the engine for Miss June? To answer the question above- TEN date codes or stamps are in the engine compartment. The oil cooler is also correctly dated, but you obviously can't see it when opening the deck lid. So, even though the engine was rebuilt once, it retains a lot of it's original parts. 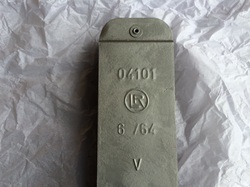 Also out of sight when opening the engine lid, is the date stamped starter motor. Miss Junes is original and date code 403. I included a photo of that above. The deck lid has the correct last three digits stamped into it. You may notice in the different photos of the engine throughout this website that there is a photo showing the plastic ribbed breather hose going from the oil filler to the right side carburetor. When I first purchased Miss June the car had the original braided cloth hose and the original braided cloth with blue stripe fuel line. I had to replace the fuel line for safety. I was wrongly under the impression that I needed to replace the braided cloth breather hose with the plastic one and so I replaced it. Good thing I kept the original one though. Once I learned the error of my ways, it went back on the car. 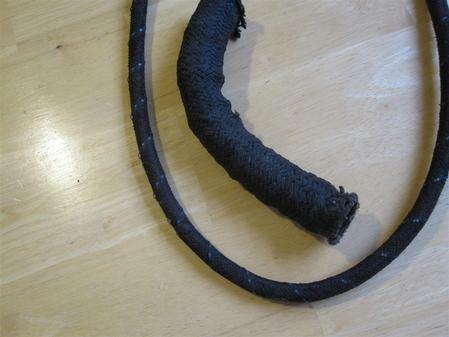 To the left is a photo of the original fuel line and breather hose. These were the factory installed parts. This is not a 356 Porsche engine animation, it's actually VW, but the principle of operation is the same. Thought this might be of interest to some, or at least entertaining. Porsche engineering has come a long way. Here is a short video clip to show some of the history.